As business owners, we are all well versed in the fact that we should be doing social media for our business: Twitter, Instagram, Facebook, the list can get a bit overwhelming, so whereabouts does LinkedIn fit into the mix? With 500 million + users, and acquired by Microsoft in 2016, LinkedIn is known as the “professionals network.” This is the place where business owners can: have a personal and business profile, post about and discuss their areas of expertise with industry peers and advertise jobs. Do you have some eggs in the LinkedIn basked? Should you? A lot of people are on LinkedIn, and while some of them (or what seems like a lot of them) are sales people and HR professionals, many of them are your fellow business owners. One handy thing about LinkedIn is that it allows you to search for people by location and title, making it a useful tool for you to find collaborators, suppliers, staff or potential clients in your area. Or alternatively, for them to find you. LinkedIn can also be useful for reconnecting with people you used to work with in a past life. These are people who you have existing relationships with and it is useful to stay in touch with them in case you can help each other out in future. 2. How do I optimise my personal profile? Apart from a profile picture and a common sense headline, make sure your profile summary explains in clear language what you do. Be sure to include common industry terms as well as layman’s terms so that people can find you if they are searching these keywords. Job adverts can be a good place to find inspiration. Writing in bullet points can make it easy for people to skim read your profile. In the media section, you can add a link to your website. This is good for your website’s Google ranking and also makes it easy for people looking at your profile to find your website. Including some small piece of personal information about yourself can help show people that you are a human being with interests outside of work. A simple sentence such as “outside of work I enjoy creating mosaics and hiking holidays” will do. You never know, sometimes work gives you opportunities to connect with people who share the same interests that you do. Make sure you upload a clear head shot. There are lots of spammy profiles on LinkedIn and having a photo of yourself will help reassure people that you are who you say you are. Also, part of the LinkedIn algorithm is to show most completed profiles first, so you want to complete your profile as much as you can. For this reason it can also be helpful to upload a background picture. Your background picture can be something work related, or if that looks too manufactured something personal is fine. If you are passionate about travel, then a background photo of the Himalayas is fine. Your background picture should not have people in is as this distracts from your profile picture. This is really quite frustrating. In my experience, a photo was meeting all of LinkedIn’s requirements, except then I realised it was actually wider than 400px dimensions wise. I resized it and it worked. It would be handy if LinkedIn gave you a specific error message rather than just a black image! The headline is the bit on LinkedIn that comes up on your profile under your name. This is also what people see in searches, therefore you want to make the most of this space. While there is lots of advice out there on having headlines that “sell your value” or include lots of keywords, as business owner, it’s best to keep it simple and clear. Job title and company name is enough, perhaps a short sentence describing what your company does if it is not clear from the name alone. You only have 120 characters to play around with, so just do what you can without going overboard. 7. I got a connection request from someone I don’t know, should I accept it? The amount of sales people on LinkedIn means that you will get a lot of requests from people trying to sell you something. You will also get a lot of requests from LIONs - aka “LinkedIn Open Networkers” - these are people who are open to connecting with anybody. 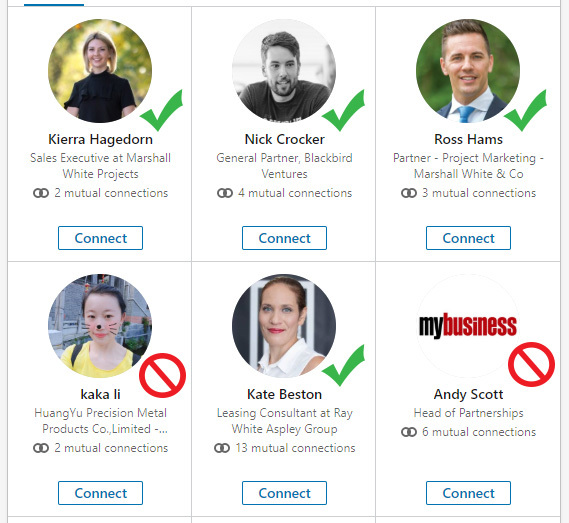 You shouldn’t connect with anyone on LinkedIn who you can’t see yourself making a relevant or useful connection with. These people will just fill up your feed with irrelevant posts, making it difficult to sort through and find the important stuff from your peers that you might not want to miss. 8. How do I merge duplicate profiles? Make sure you are logged into the profile that you want to keep. This should be the profile with the most activity, connections and messages. 3. Enter the email address and password of the account you want to merge (should not be the account that you are logged into). 4. Your accounts will now be merged. You connections from the duplicate account will be merged, but your messages and post history will be lost. This is why it is important to do the merge from the account that you want to keep. 9. Should I have a business page? Yes, it is useful to have a business page, so that your company can appear in relevant LinkedIn searches. It is also useful for search engine optimisation (SEO), as having verified social profiles pointing at your website proves to Google that you are valid. Make sure your company name, address and phone number are consistent across LinkedIn, your website and your Google Business listing. Google counts these as “citations,” and having accurate citations ensures you get maximum SEO juice. 2. Select a name and URL for your company. Your company name should match what you have on your Google Business Listing. This is important for SEO. If LinkedIn tells you that another company already has the name, don’t worry, you can still proceed. You will have to edit your URL to make sure that is unique, but you can still have the name you want, even if it is the same as that of another company. 3. Now upload a background photo, a company logo and edit your tagline. Under Edit > Detailed Info be sure to link to your website. Backlinks from social media profiles are an important indicator to Google that your business is legit. In the description section, include keywords that people might use to find you. Under Edit > Locations be sure to add your office address/addresses exactly as they appear on your Google Business Listing. 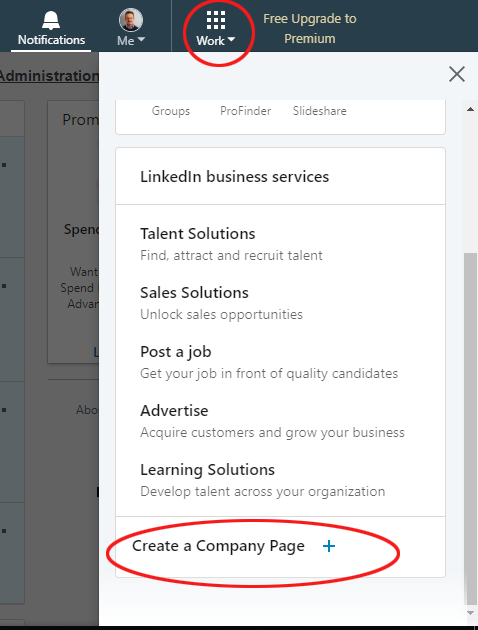 Now that you have created your company page, let’s give it some employees. You can add your company to your LinkedIn profile by going to your profile page. If you already have the company listed on your profile (perhaps without an official company attached to it), simply click on the pencil button to the right of the position. If you do not have your current position on your profile, click “+” to add it. In the “Company” box, start typing the name of your company until you see your company logo. Sometimes LinkedIn’s cache seems to take a little while to update. If you don’t see your company appearing, try refreshing the page a couple of times. You probably also want to turn off the button that says “share with network.” Otherwise all your current contacts will get a notification that you’ve got a new job! Although, that could be a good thing if you want them to see your new LinkedIn page. Encourage your employees to follow the above steps too, and make sure that they are linked to your official company page on LinkedIn. Having more employees connected to your company page will help it rank higher in search results. Perhaps there is someone else you would like to add to help you administer your company page? It is usually a good idea to have multiple admins on a company page. There have been plenty of circumstances where an employee has created a company page and then exited the company, leaving no one with access to the page. Reclaiming the page can be difficult and time consuming. Once on the company page go to Admin tools > Manage Admins. Here you can search for people and add them as admins. 13. Should I post on my company page? What should I post? You can post on your company page. Depending on your business size and how many resources you can dedicate to it. For starters post any available jobs on there and any relevant company updates such as big projects you have finished. If you have a company blog, it would also be good to share your latest posts here even if there are only quarterly or monthly. An active LinkedIn page will keep you top of mind in people’s feeds and will help with your LinkedIn and Google ranking. However, quality is more important than quantity. Make sure what you are posting has some substance to it. You are now on your company page. Scroll down until you see the box beneath the header that says “Share an article, photo, video or idea”. Start typing in the box. It is a good idea to include a relevant image or video as this will make your post more eye-catching. Once your are ready to publish hit “post”! Note that people will only see your post if they are following your company page. This is a bit chicken-eggy though, people will only follow your company page if they see it is active. Start with posting and work on acquiring followers by linking back from your website and sharing posts on your personal LinkedIn profile as well. Should you post on your personal page or your company page? Ideally you should post on both. It doesn’t matter if the posts are the same as they will be relevant to both scenarios. Your company page may have different followers to your personal profile and vice versa. 16. Should I join LinkedIn Groups? If you Google “Tips for LinkedIn” or “Optimise my Linked In” pretty much all the articles on the first page will tell you to join and participate in LinkedIn Groups. This advice is out of date. LinkedIn groups have died a slow and painful death, spurred on by a few things such as the inundation of spammy content and mismanagement by LinkedIn/Microsoft (Mircosoft bought out LinkedIn in 2016). Click the tiny link down the bottom that says “Search other trusted communities that share and support your goals. LinkedIn will come up with some suggested groups, but there is no option to search groups. Click on one of these groups and you will see they are full of people posting without engaging in any meaningful conversation. There are no comments on the posts. It is all take and no give. Facebook groups are thriving and they can be an excellent place to find out common questions that your potential customers might want to know. The good thing about Facebook groups is that they are often gated which means that you have to request to join and spammy people get kicked out. This keeps the conversations flowing and relevant for everyone. Apart from Facebook Groups, you can follow hashtags on LinkedIn and you can follow influencers. This makes it easier to find better quality, interesting content that you can learn from, comment on and contribute to. 18. Should I have a showcase page? A showcase page is like a company page but for products. You do not need a showcase, unless you are a big company. Maintaining and updating showcase pages will require a lot of effort that will not really pay off unless you have dedicated products with large followings. Eg. Adobe. You will also need the time and resources to keep them updated. LinkedIn is a great place to have a professional profile for both yourself and your business. While groups have died off, LinkedIn Learning has taken off and other aspects of the platform continue to be developed. It will be interesting to see where LinkedIn goes in future! Have you use LinkedIn successfully for your business? What are your LinkedIn business tips? Small business SEO: How can I increase my authority with Google?